I'm definitely in denial about winter approaching and the end of our paddling and biking season. In fact, we had our first snowflakes today -- a slushy mess! Never mind. 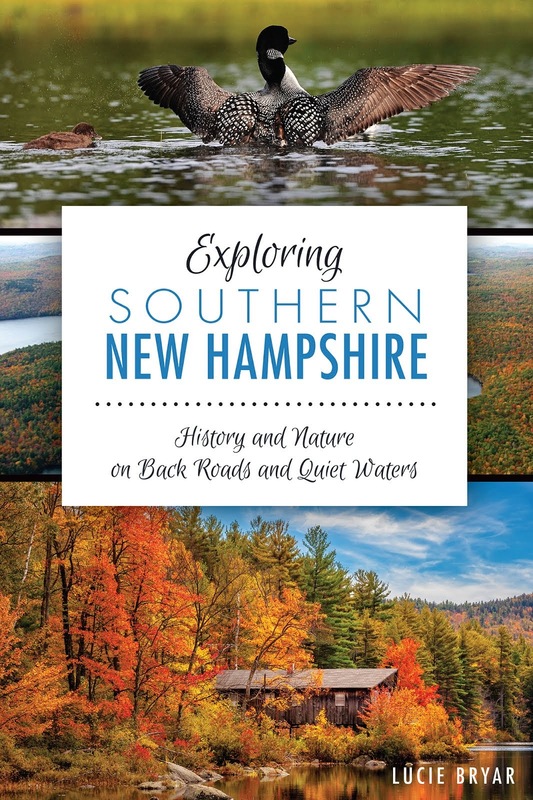 I recently discovered a great blog by fellow Granite Stater Jim Johnson of Salem. Jim is into running, hiking, and biking, with a big emphasis on running. His blog has an incredible amount of detail about road races, his workouts and his results (everything from 5Ks to the run up Mount Washington.) You can check it out at http://www.doublejrunning.blogspot.com/. What especially caught my eye on the blog is the photo gallery -- including some great photos Jim and his girlfriend Kristin took of the Windham Rail Trail during foliage season. We biked this trail a few years back, but I've never reviewed it. The Windham Rail Trail runs just 4.1 miles, beginning at the intersection of Routes 111 and 28 in Salem and running to North Lowell Road in Windham. (We rode it in reverse.) It's a great excursion when you're short on time or energy, but you still want to get out and enjoy nature. I could try to describe the trail, but the photos say it so much better. See for yourself at Jim and Kristin's photo gallery. Someone asked me recently what I like about quiet water kayaking, as in, "What's the thrill?" Well, there is no thrill really. No speed, no cheering crowds and no adrenaline rush of victory. And that's exactly what I love about it! I love the peacefulness, being close to nature, being on the water. When you're kayaking, you can touch the water, smell the water lilies, watch a dragon fly, listen to the call of the loon. It's like hitting the "pause" button in the daily grind of life. With that said, let's take a look back at some of our favorite spots this season. Be sure to send us comments and let us know about your favorite places. 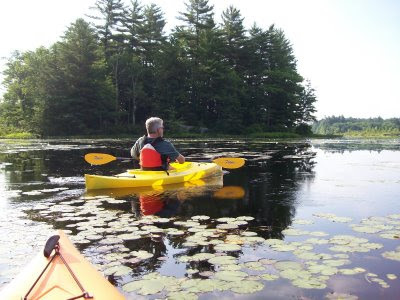 A Perennial Favorite: It's no secret that we love Gilmore Pond in Jaffrey. Call it serendipity. Each time we've paddled here, everything seems to come together. The bluest sky ever, the warming rays of the sun, crystal clear water, an eagle soaring overhead. I realize that not everyone will score a "hat trick" when it comes to Gilmore, but we've been lucky each time we've paddled here. Worth the Effort: The Turkey Ponds in Concord aren't the easiest to access. There's a bumpy, rocky road to the put-in. But they are definitely worth the effort. There's virtually no shoreline development and when we paddled here, there was very little boat traffic. The plant life, intriguing granite rocks, small islands and lots of acreage make for a very pleasant paddle. 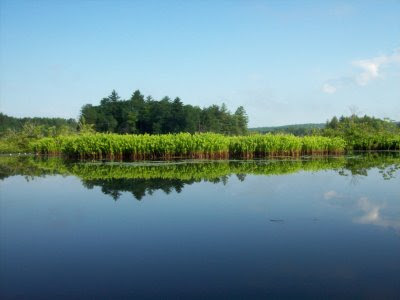 Most Peaceful: For us this year, it was Willard Pond in Antrim, NH. Again, there's virtually no shoreline development and motor boats are not allowed. The water is clear; loons and other wildlife dominate and there's a view of Bald Mountain. Not a large pond, but very inviting, relaxing and easy to access. I don't know about you, but I'm already looking forward to next season on the water. I just joined a kayaking group near Hampstead, NH. They use the internet to plan trips together and it seems like a diverse, friendly bunch of all ages and skill levels. While there are times that Doug and I just want to get away and enjoy the peace and quiet together, there are also times when we'd love to venture out to new places with new people. Check out the group on MeetUp.com. It's November (cold and gray) and our kayaking and biking season is quickly coming to a close. I plan to spend the next few months researching some great places to explore for next season and trying to get outdoors to enjoy winter. But to be honest, I'm not a big fan of snow, cold, and ice (brrrr!). I'll also write a season wrap-up soon, highlighting our favorite spots and experiences for 2008. In the meantime, you're invited to take a brief tour from our photo album. This one is a mix of photos on smugmug.com from New Hampshire, Massachusetts, and Maine. Enjoy!